Contemporary advancements afford long lives for our favorite pets. As a result, many canines reach older ages. While pet owners love the additional years with beloved friends, this introduces new pet care problems. Aging dogs require special attention. However, some easy steps can help your family’s best friend enjoy advanced age. We love our pets and want them to be comfortable and happy. Consider some of these tips when handling the special needs of your older dog. Premium quality foods are vital for the health of any canine. Unfortunately, many inexpensive dog foods include a number of unhealthy fillers. For example, some companies stuff their dry food formulas with onerous quantities of corn. Inefficient food sources will not provide ample nutrition without taxing your dog’s digestive system. 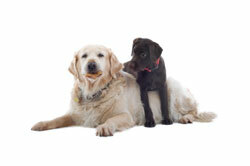 Furthermore, cheap pet foods use larger servings to meet your dog’s daily nutritional needs. While you may feel that these inexpensive dog food brands offer a great value, the serving sizes are much larger. If you evaluate the cost of each serving, premium pet foods are an excellent deal. Some premium pet food brands offer formulas for seniors. Quality nutrition will equip your dog with the right nutrients to meet upcoming health challenges. When shopping for pet food, spare no expense for your older dog. An aging dog does not have the same physical capacity. Your family friend may have a difficult time standing up and walking. However, exercise is important for good health. Play fetch and take walks together. You might have to exercise your dog for a very short period of time for health reasons. However, every little bit counts. Unused muscles can experience atrophy. Proper grooming improves the health of pets of any age. However, it is even more important as your dog grows older. An older dog might be plagued by sores. If these sores become infected, serious health problems might emerge. For this reason, you should groom your dog very frequently. Clean your dog’s remaining teeth. While brushing your pet’s coat, check the area around the ears, eyes, and mouth. Infections might settle in these locations. If you groom your pet regularly, you will notice such problems at an early stage. Early detection of serious health problems improves your pet’s chance of survival. Older dogs might have a tough time with traditional house training techniques. Your pet may make a few mistakes on the carpet. While you want to remind your dog of the rules of the house, consider health issues that might require frequent trips to eliminate waste. Adjust your schedule to meet the new needs of your aging pet. Give your dog a little extra consideration when scolding for problems that may relate to the consequences of advanced age. Caring for your older dog can involve some unique challenges. However, with a little extra care, you can provide your pet with comfort during this difficult period of life.